PHOTOS: DARREN MILLER/UI ATHLETICS Jahisha Thomas leaped to a third-place finish in the long jump this past June at the NCAA Track and Field Championships in Eugene, Oregon. 2017-18 marked a banner season for UI track and field star Jahisha Thomas. She improved her lifestyle, academic focus, and career outlook, but was nearly derailed this past January when she reinjured her left hamstring while sprinting in practice. Thomas recovered to claim the 2018 Big Ten long jump and triple jump indoor and outdoor titles and take another step in her future beyond the track. A breakout British Trials performance in July 2017 first motivated Thomas to strengthen her resolve toward a championship season. After her third-place finish in the triple jump, the London native imagined what she could accomplish on the track for her senior season with a more deliberate routine outside of practice. She began closely monitoring her diet and sleep schedule, increased her stretching, and guzzled at least two liters of water each day. "Practice is only 20 percent of the whole process," says Thomas. "And [practice] was what I always focused on before." In June, Thomas posted a pair of top-six performances at the NCAA Championships in Eugene, Oregon, to lead the Hawkeyes to a program-best 13th-place outing. The six-time NCAA All-American finished her UI career with school records in the indoor and outdoor triple jump and indoor long jump. A month later, she leaped 21 feet, 11.5 inches to place fourth in the long jump at the British Athletics Championships. Though Thomas exhausted her Hawkeye eligibility, the four-time Big Ten champion will continue training with UI sprints coach Clive Roberts in pursuit of a pro career. Says Thomas, who graduates this winter: "I want to channel my energy into track while I can." Thomas clinches the Big Ten outdoor long jump title. 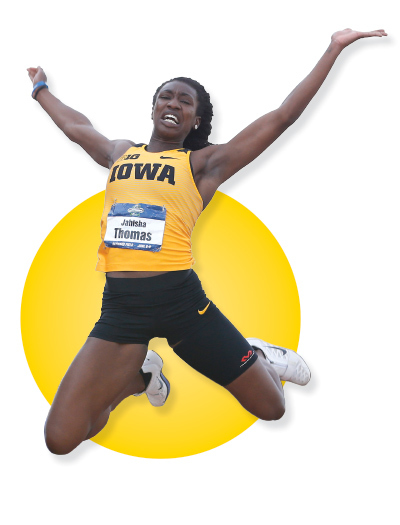 Last year, a Daily Iowan TV poster seeking reporters led Thomas to a field she'd like to pursue following her track career. The ad posted in the Pappajohn Business Building caught her eye because she had always wanted to be on TV and make people smile. Thomas gives a weather forecast on Daily Iowan TV. Soon after, Thomas gave weather forecasts on DITV, changed her major from finance and accounting to business arts management, and raised her GPA to a 3.7. In April, she started a public relations internship for Living Full Out, a motivational radio and TV show where she edits videos and schedules bookings remotely. She'll continue the internship—and her work for DITV—through the fall semester as she eyes a long-term career in television. "I've changed my major to something I actually want to do and believe that I'm good at," Thomas says. "Doing the Daily Iowan is confirmation I can do it." An MLB star chose the UI twice. The second time may have saved his life.